The Uros Goodspeed MF900 is a solid product for businesses who travel frequently and need secure, reliable connectivity outside Europe. But that comes at a cost. Mobile hotspot devices are now a rare sight on daily commutes. Blame the rise of tethering – which uses the built-in capabilities of modern mobile OSes and more generous data packages – for that. However, there is a niche market for mobile hotspot devices and that is international travellers. The Uros Goodspeed is one of them and specifically targets businesses and their roaming employees. Built by ZTE, the MF900, as it is also known, supports up to 10 SIM cards at once – you will need to use adaptors for nano-SIMs. One of those slots is reserved for the Uros system SIM. Externally, it is slightly thicker than a standard smartphone with a 128 x 128-pixel OLED display and a tiny blue status LED on the fingerprint-friendly shiny plastic front facia. Sliding the latter down gives you access to SIM card slots. The rest of its body is made up of a soft-grip material, anthracite in colour. Assuming that you have already signed up as a Goodspeed user and activated the device, switch it on – the power button is located on the left – and you're faced with a familiar user interface. Remember those feature phones from 10 years ago? You've got the battery icon, the network connectivity one (showing either 3G or 4G) as well as the Wi-Fi hotspot icon which tells you how many devices are connected. Surprisingly, there is no microSD card memory slot, a useful addition found in most recent, standalone mobile broadband devices. Our test device did an OTA (over the air) update on starting up and quickly displayed the territory and the status (i.e. connected) after a couple of minutes searching for networks. Sadly, we couldn't test the service outside of the UK – Uros tells us that searching for networks in other countries might take just as long if not longer. Fortunately, the MF900 provides you with a handy progress bar as well. You can cycle through the status screens thanks to a menu button on the right. The second screen gives you the details of the hotspot – SSID and password – while the third one provides you with the device details (serial number and software version). You can access the control panel of the hotspot via your browser and see devices being connected as well as changing its basic settings (including decreasing the number of devices connected and the range of Wi-Fi coverage). A short Wi-Fi range coupled with an aggressive sleep time setting ensures that the 3200mAh battery lasts for far longer. The latter is a significant improvement on previous models – according to ZTE, the battery will last up to 12 hours on a single charge, stay in standby mode for seven days and get a full charge in three hours. As always, your mileage will vary depending on a number of variables. The modem supports software-based encryption and uses a Qualcomm Gobi MDM9225 modem chipset which supports all mainstream 4G frequencies (FDD/TDD) with theoretical upload and download speeds of 50Mbps and 150Mbps. Obviously, you will never actually reach those speeds but it is reassuring to know that 4G is available, especially as up to 15 devices can be connected to the MF900 at any time, 14 via Wi-Fi (up to 802.11n) and one via the USB port. 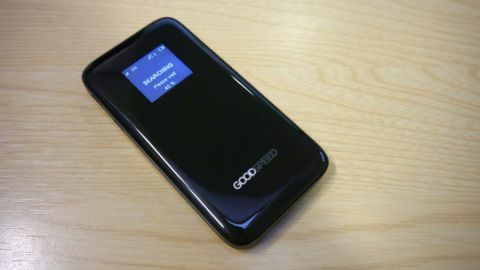 The Uros Goodspeed MF900 is only as good as its coverage and at the time of writing, 75 countries were part of the network with only 10 countries offering 4G, most of them in Europe. There were some notable exceptions though. China and Egypt for example were greyed out and Mauritius, a popular destination for Brits, was not part of the bundle. You can buy the device on its own for £198 excluding VAT (around $300, AU$410) with the £13.70 day-pass being the best option, or on a two-year contract for £19.10 monthly, a deal which includes the Pro Plan which allows you to use your own SIM cards. That excludes an activation fee for each SIM card ordered which adds to the delivery fee as well. Businesses would probably be better off with the aptly-named "Business" plan which offers a day-pass from as little as £4.90 with additional features including centralised device management, usage statistics and API access to data. Note that there's an additional fee to be paid and the daily data limit on all three tiers is either 500MB or 1GB depending on your selected territories. Fortunately, when you reach your data limit, you will be slowed down rather than totally disconnected. Ordering SIMs for your travel needs can be done online but bear in mind that they are locked to your devices and won't work on any other devices.